It was my husbands Birthday this weekend, and he has always been a huge Michael Godard fan. 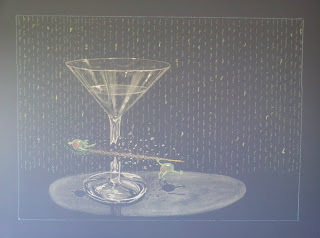 The Matrix Martini is his absolute favorite painting, but sadly we cannot currently afford to buy a print. I therefore decided to recreate this painting on our chalkboard wall for his Birthday. I drew this one freehand, using a picture from his book as a reference. Here are the progress photos. I hope you enjoy.